These are also the perfect cookies to make for the Holidays. 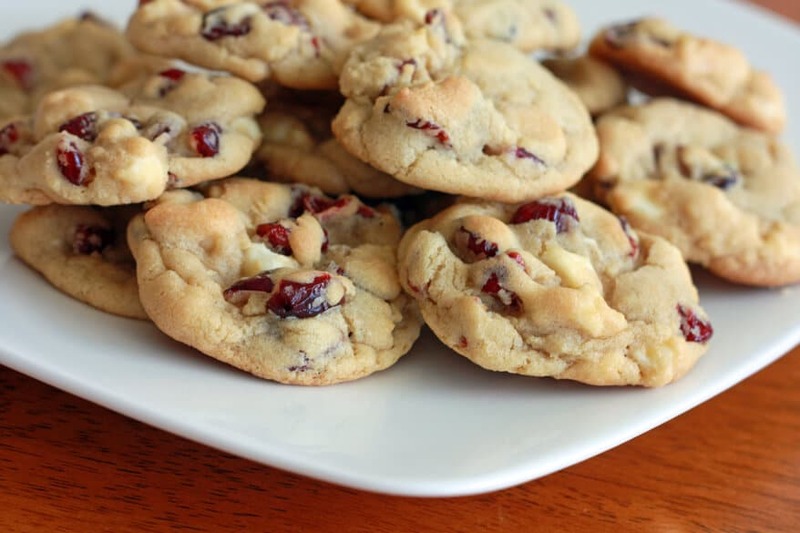 You can use either dried cherries or cranberries. Preheat oven to 375 F. Grease a cookie sheet. In a large mixing bowl, combine the butter and sugars. Using an electric mixer, cream the butter and sugars until fluffy and pale in color, 3-5 minutes. This step is important for ensuring soft, chewy cookies. Beat in the egg and vanilla extract. In a separate bowl, combine the flour, baking soda and salt. Using a wooden spoon, carefully stir the flour mixture into the butter mixture, just until combined. Stir in the white chocolate chips, dried cherries and macadamia nuts. Drop heaping spoonfuls of the batter onto the greased cookie sheet. Bake the cookies for 8-10 minutes or until they just begin to turn golden around the edges. Allow the cookies to cool for 2 minutes on the cookie sheet before transferring them to a wire rack to cool completely. *Note: It isn't necessary for this recipe (I personally prefer the cherries to be chewy), but you can optionally place the dried cherries in a bowl and cover them with boiling water to soften them. Let them soak for 7-8 then thoroughly drain them. If you choose to soak them, use only ½-3/4 cup dried cherries as they will expand. Thanks to my friend, Candy, for inspiring me with the idea to add the final crowning touch…macadamia nuts! Oh man….these look incredible! My aunt lives in Hawaii, and she just sent me some macadamia nuts from Mauna Loa. Mmmmm…. Okay. Must. Veganize. Now. Haha, awesome! I’ll definitely need to check out your vegan version when you’re done. And you are lucky to have that Hawaiian-dwelling aunt who supplies you with those delectable macadamia nuts!! Thanks for stopping by again, Lindsay. Ooooh. I used to dislike white chocolate until I had these cookies in London. Now I’m sold. Making these soon! These look amazing! I’m making these for a party and can’t wait to try some :) Thanks for posting such great recipes! Thanks, Tori. Nice to “see” you again. I’m confident you and your friends are going to LOVE these! 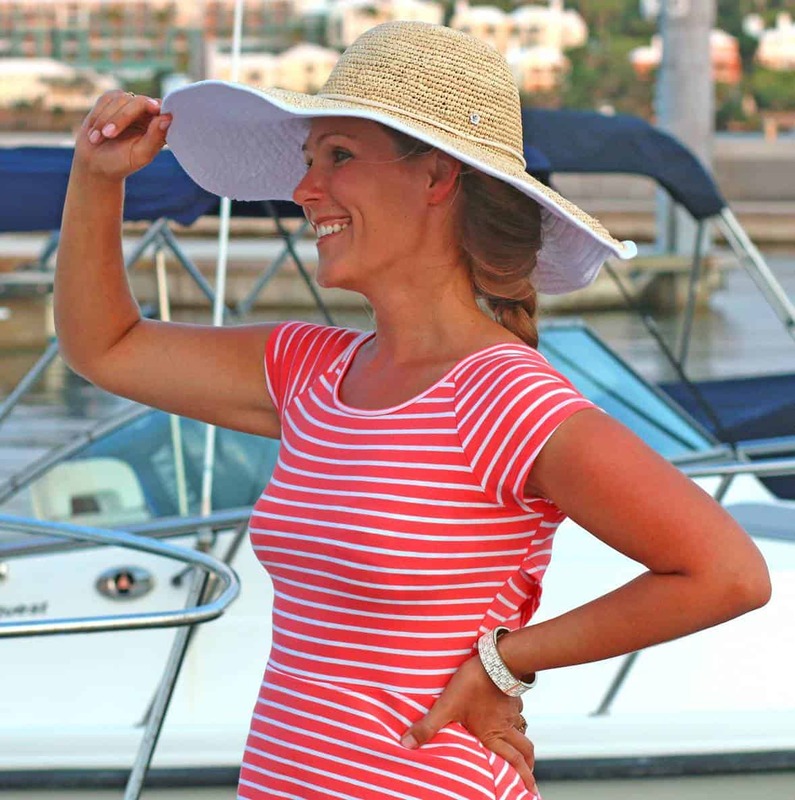 Wonderful, so glad you liked them! It’s true, beating that butter in sugar is really an important step. I use that method for most of the cookies I make. Thank you for your feedback! Those sound absolutely amazing! Thanks for sharing them on MMB. These sound and look so delicious! My dad and husband are big cherry lovers! Following you from MMB! I made these cookies today, and while they are DEELISSHOOS they did spread too much. I bake a lot and try to do all my ingredients by weight, not volume. Volumes of flour are always tricky because the real amount of flour varies so greatly if you have/have not sifted the flour first. I took the King Arthur weight chart and converted the 1 1/2 cups Unbleached all-purpose flour into 6.4 ounces (181 grams). Sadly, this wasn’t enough flour, so maybe that weight chart isn’t the right tool for your recipe. The next time you make these cookies, could you please weigh the flour and let us know? I’d be curious what the weight actually is. Hi Gretchen! Yes, this recipe is for standard U.S. measurements, which is by volume. Measuring by weight is important for more finicky kinds of baking like gluten-free, but for standard recipes by volume generally works just fine. I actually just made a double batch of these last week. I don’t bake with white flour very often, so it will probably be a while before I make these again. When I do though, I’ll try to remember to weigh the ingredients for you. I know its craziness, but I don’t actually have a working electric mixer right now. Any recommendations? Oh, MAN! These are good. First off I want to say that I have been searching for YEARS for that perfect, chewy cookie recipe. I’ve tried just about every recipe I could find and I’ve always been slightly disappointed. I had no idea the key was beating the butter and sugar for so long. Also, I made these for my boyfriend who doesn’t care for white chocolate (he likes milk chocolate, and milk chocolate only. No dark, no white) and they were still amazing with the milk chocolate. Thank you for this recipe! 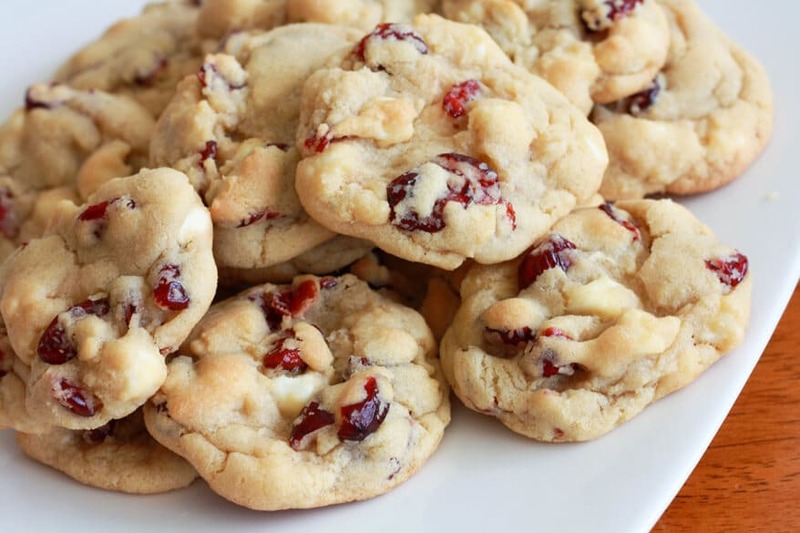 Can I use glacé cherries for this cookie recipe? Hi Ann, I haven’t tried that and am not sure what it will do to the overall texture of the cookies since glacé cherries have a higher liquid content than dried. Very good, especially if you use pecans instead of macadamia nuts. Can you use fresh cherries? Hi Resa, I don’t recommend it – fresh cherries have a very high liquid content and you’ll end up with wet dough. I don’t have any baking soda at the moment can I use baking powder? Hi Amanda, you can give it a try but baking soda is 3 times more powerful than baking powder so you’ll need to use triple the amount of baking powder and that may alter the taste. I soak the dried cherries in cherry brandy first… you want to talk over the top? I made these twice once with success and once without. I’m not sure what I did wrong but one batch came out rock hard. Did I overcook them? Wonderful, thanks so much, Karen! I didn’t have white chocolate used dark instead….didn’t add alot of white sugar.They came out great…. Where did you find dried cherries that are so red and pretty? The only ones I can find are so dark that they look like raisins. Hi Gwrn, I think I got those particular ones from the bulk section at Winco. I have attempted to make these this recipe twice, today. Both batches, well… neither batch has turned out. I’ve never botched a batch in my life, and I did twice today. I had to use Craisins instead of dried cherries the second batch, as I didn’t want to go back to the store to buy more cherries in the event that the batch would not turn out. I was right. You indicate to make the dough into balls and place them on the cookie sheet. The balls are not falling. I threw the entire first batch away. This second batch has been in the oven for nearly 15 minutes and they’re just starting to fall, but they look dry. Can I use slivered almonds for the nut? Hi Jan, absolutely! You can use any nut you like. Fantastic, Debbye, I’m thrilled to hear that, thank you! Made a batch yesterday for my hubby’s birthday; followed your recipe to a “T” and they came out so perfect! My oven runs just a tad hot so I had to watch them like a hawk.I am going to hunt for the pretty red cherries, although he said he didn’t care what they looked like; they were delicious! ! I did sift the flour and they did spread nicely–I made them pretty small so got about 30 out of the recipe. I think I wouldn’t double the recipe as it would kill your arm, but just make them in succession!Thanks so much for this great recipe; I will be back for more–anything vegan/vegetarian! I’m so glad you enjoyed them, Laurie, thank you! Lots of good vegetarian options here, just type “vegetarian” into the search box and there are also substitution recommendations for some of the meat recipes as well as vegan substitution recommendations. Thanks again and happy cooking!